Top government officials from all over China will gather in Beijing for the annual rite of spring - the Chinese People’s Political Consultative Conference (CPPCC) and the National People’s Congress (NPC) sessions to be held on 3rd and 5th March respectively. The typical focus in these meetings is Premier Li Keqiang’s work report, as well as speeches by the heads of the central bank and other regulatory bodies. Premier Li’s report sets out economic targets for the year – GDP growth, inflation, money supply, bank lending, etc. – and also policy changes required to achieve these targets. The trade rift with the US is playing a significant role in shaping the economy and macro policy in China. The media has signalled a possible growth downgrade target for this year to a '6.0% to 6.5% range' from ‘around 6.5%’ in 2018, which makes more stimulatory policies the order of the day. The stimulus is already being rolled out within the confines of the current policy stance of 'prudent' monetary policy and 'pro-active' fiscal policy - the stance likely to be reinforced next week. China’s economic growth continues to soften as the sixth consecutive drop in the manufacturing PMI in February suggests. 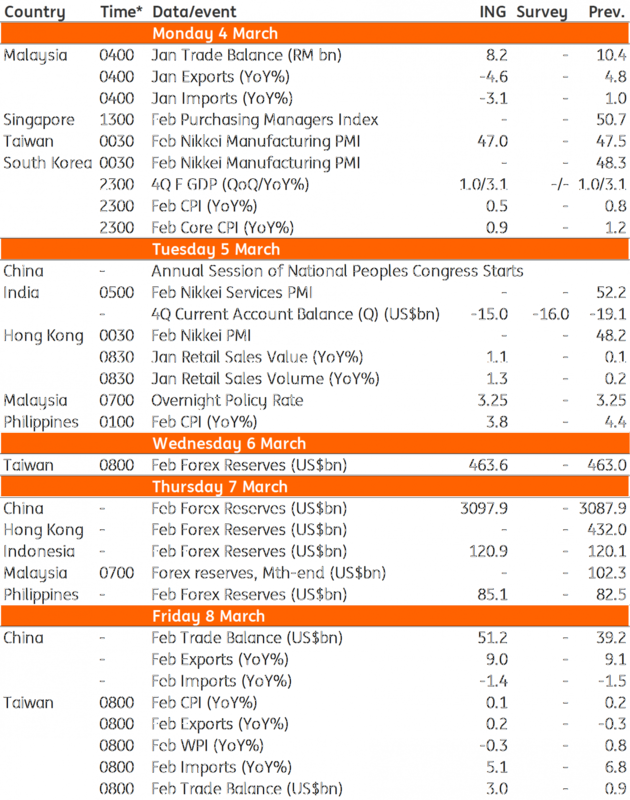 The message from the forthcoming data – February trade, inflation, and monetary data, all due next week – is unlikely to be any different. We believe the markets will be biding time until the Trump-Xi summit on trade at the end of March. Trade and inflation data dominate the economic calendar for the rest of the region. Asian exports have been under pressure from the trade war and slumping global electronics demand, as the data from Taiwan and Malaysia is likely to reinforce. Among all inflation releases, Philippines’ steals the focus. From a peak of 6.7% YoY high in September-October 2018, inflation has slowed sharply through January to 4.4%. Further fall in February will see it return to the central bank’s 2-4% target, thus opening the doors for reversal of some of last year’s 175 basis points rate hike this year, while the dovish US Fed policy allows for some local currency strengthening. We anticipate two 25bp cuts in the second and fourth quarters of the year. Inflation in Korea continues to be low, and in Taiwan, it's almost non-existent. We don’t think the Bank of Korea’s 25bp rate hike last November was at all needed. The BoK left the policy on hold today. Governor Lee Ju-Yeol cited the Fed’s and ECB’s policy stance as important factors in deciding the policy. We think the weak domestic economy, trade uncertainty, and dovish G3 central banks' policy puts the BoK next in the line of Asian central banks to cut rates later this year. Malaysia's central bank announces the outcome of its policy meeting on 5th March. BNM meetings had been really boring lately, but this one may be less so after the latest CPI data showing negative inflation for the first time in nearly a decade, thus raising the prospects of policy easing. However, the recent falling streak in CPI is the result of supply-side factors (the administrative cut in domestic fuel prices) that nothing the monetary policy could do about. We believe BNM will see through the latest data and leave policy unchanged. 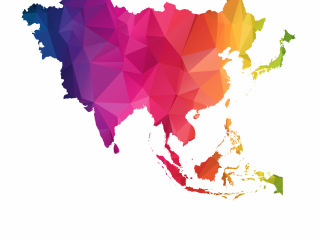 Asia week ahead: How will Malaysian markets react to a political shift? Malaysia: Will Bank Negara turn dovish?